Michael Faraday was born on September 22, 1791, near London, England. Faraday was so poor as a child that his mother would give him one loaf of bread to last a week he would make 14 marks in it so he could measure it out and be sure of having at least something to eat twice a day. At 13 Faraday began working, selling newspapers and binding books, spending his spare time reading pages from the books he was binding. Two books he worked on in the shop included a section of an encyclopedia about electricity and a book on chemistry. His life work sprung directly from reading them. One of the customers at the book shop was so impressed with Faraday’s hard work that he offered to take him to a series of lectures by HUMPHRY DAVY, one of the most famous scientists of the time. Faraday took detailed notes and sent them to Davy, hoping to get Davy’s attention. It worked, and the scientist hired him as his assistant and sponsored Faraday’s admission to the Royal Institution, a science school and laboratory. The quality of his work was so good that in 1813 Davy asked Faraday to accompany him on a trip to France, Germany, and Italy. There the young Faraday met—and learned from the greatest scientists in Europe. 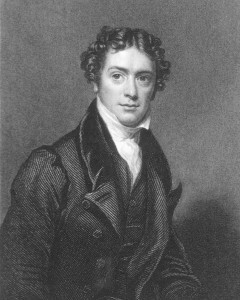 Faraday apprenticed with Davy until 1820. Some scientists knew how to make electricity from chemical reactions, the beginnings of the batteries used today. But Faraday became convinced that there was a connection between electricity and magnetism, and discovered that when he thrust a magnet into a coil of wire, a trickle of electricity emerged. By 1831 he had developed a generator, called a disk dynamo, the prototype of the giant electric power plants that generate electricity today. Faraday’s innovations were numerous, including the discovery of benzene in 1825, a pioneering method for liquefying gases, and the production of stainless steel. He also used optical glass to rotate the plane of a polarized light passing through a strong magnetic field, demonstrating a relationship between two different forms of energy. With his mentor Davy, Faraday also thoroughly investigated the element chlorine. Faraday was a genius in the lab, conducting experimental investigations with thoroughness and rigor. He was also a gifted teacher; beginning in 1826, he communicated the beauty of science to large and appreciative audiences. He died peacefully in his study chair on August 25, 1867. Michael Faraday was the first person to convert mechanical energy into electricity; laying the foundation for great strides in future theoretical and practical work concerning electricity and magnetism. Within a generation a scientist in neighboring Scotland, JAMES CLERK MAXWELL, would build on Faraday’s discovery and use it for the cornerstone of his comprehensive laws on electricity and magnetism, published in 1873. Other scientists in many fields were directly affected by Faraday’s methodology. His improved experimental methods—clearly stating the problem, carefully carrying out experimental procedures, and completely recording results—provided a model that others would follow. Faraday’s work led to the development of transformers, coils of wire wound on a metal frame that could concentrate electrical energy and increase voltage in a circuit, or spread out energy to make a lower voltage. Transformers are everywhere today, from power packs for computer games to large canisters on utility poles and huge fenced switchyards at power plants and substations. Faraday’s insight not only provided the means to generate electricity but also to distribute it over long distances. In chemistry Faraday provided an improved understanding of how ions in solution conduct electricity, leading to a way to count and measure atoms and to our modern technique of electroplating. Chlorine, which he investigated, would become one of the most important industrial chemicals in the twentieth century. Faraday’s friend and teacher, Davy, was once asked late in his life about his greatest achievement. He answered that his greatest discovery was Michael Faraday.